Grant writing in this new economy, how has it changed? 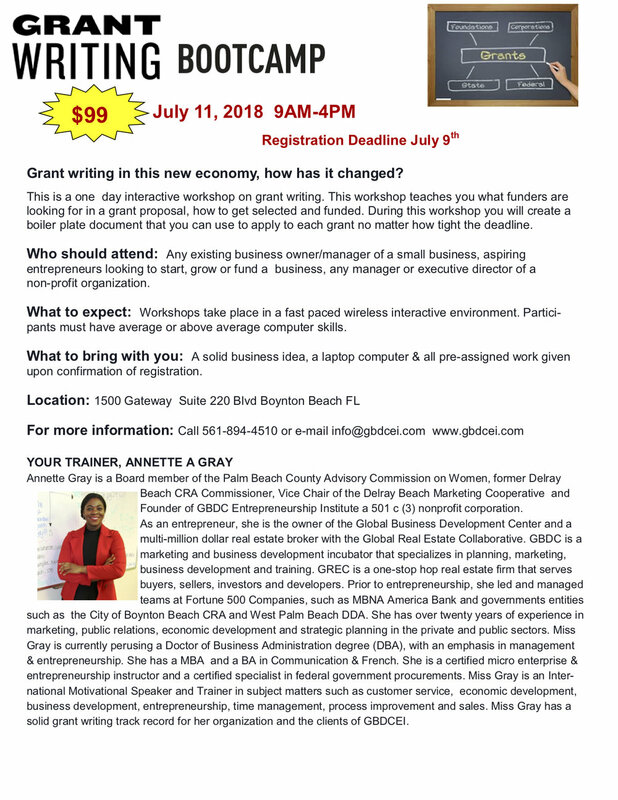 This is a one day interactive workshop on grant writing. This workshop teaches you what funders are looking for in a grant proposal, how to get selected and funded. During this workshop you will create a boiler plate document that you can use to apply to each grant no matter how tight the deadline. Who should attend: Any existing business owner/manager of a small business, aspiring entrepreneurs looking to start, grow or fund a business, any manager or executive director of a non-profit organization. What to expect: Workshops take place in a fast paced wireless interactive environment. Partici- pants must have average or above average computer skills. What to bring with you: A solid business idea, a laptop computer & all pre-assigned work given upon confirmation of registration. Register today with the below form for the July 11th class. Please make payment for workshop by clicking the "Make Payment Here" button. Thank you and we will see you on the 11th of July!